On Thursday morning, Islamic State affiliate Walayat Sinai has claimed its responsibility for a guided missile attack against an Egyptian Coast Guards vessel which was set ablaze. Egypt confirmed the attack but did not give details about the incident. The vessel hit in the attack is not a Frigate as claimed but appears to be a Swiftships 26 M Patrol Craft of the Egyptian Coast Guard. 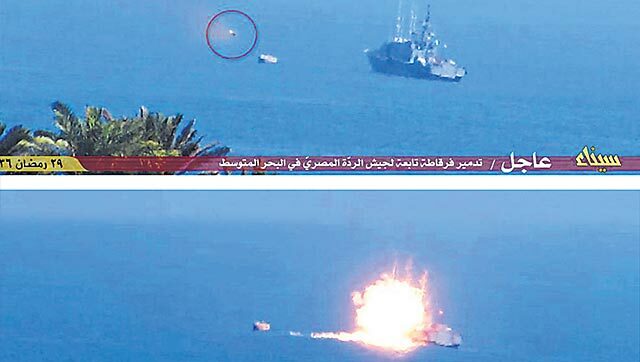 Photos published by Islamic State showed a guided missile flying towards the vessel and an explosion on what the group said was a “frigate.” The vessel hit in the attack looks in fact to be U.S. Made Swiftships 26 M Fast Patrol Craft. According to the manufacturer's website: SWIFTSHIPS’ 26 Meter Fast Patrol Craft is a triple water jet, diesel powered, all-welded aluminum patrol craft. The hull consists of four (4) watertight bulkheads forming five (5) watertight compartments. The functionality of this vessel is to contain and conquer almost any aerial and subsea enemy threats. The hull and superstructure are constructed in accordance with applicable codes or requirements of the client. Between 2010 and 2014 Swiftships designed and built four patrol craft for the Egyptian Navy, with two assembled in Egypt and the other two co-produced by Egypt and Swiftships. The missile used in the attack is not an anti-ship missile. It is most likely a russian made 9M133 Kornet Anti-tank guided missile (ATGM) (NATO reporting name AT-14 Spriggan). According to our partner Army Recognition, the Kornet is designed to defeat current and future ERA-equipped tanks, lightly armoured vehicles, fortifications and low-flying air targets in electronic and jamming environments at any time of day and night in any weather conditions.